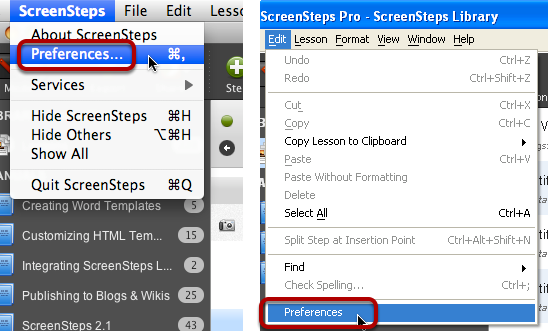 ScreenSteps Desktop 2.9 and Workgroup DocumentationScreenSteps Desktop & WorkgroupScreenSteps 2.9 Exporting to the System ClipboardHow do I Specify Which Template Is Used When Exporting To Clipboard? On the General tab you can select the template you would like to use when copying a lesson to the clipboard as PDF (2) or HTML (3). The list of PDF templates (2) is taken from the PDF templates available in the PDF Templates tab. The list of HTML templates (3) is taken from the the Clipboard folder in the HTML templates folder. For more information on the templates folder please see our manual on Customizing HTML Templates. Next: How do I paste the path to the PDF file into a file selection dialog on OS X? It would be helpful if you had examples of all the templates.